Clean with a relaxing open feel. When walking in, the updated kitchen has new appliances fully furnished with toaster, coffee pot, dishes, pots & pans, all utensils and a few spices and oils. Accommodates 4 ppl, 2 queen bd. This townhome has 2 bedrooms and 1.5 bathroom. Washer and dryer are downstairs with a half bath. Upstairs has 2 bedrooms and a full bath, complete with towels and linens. Town home is perfect for couples, solo adventures, families and business travelers. 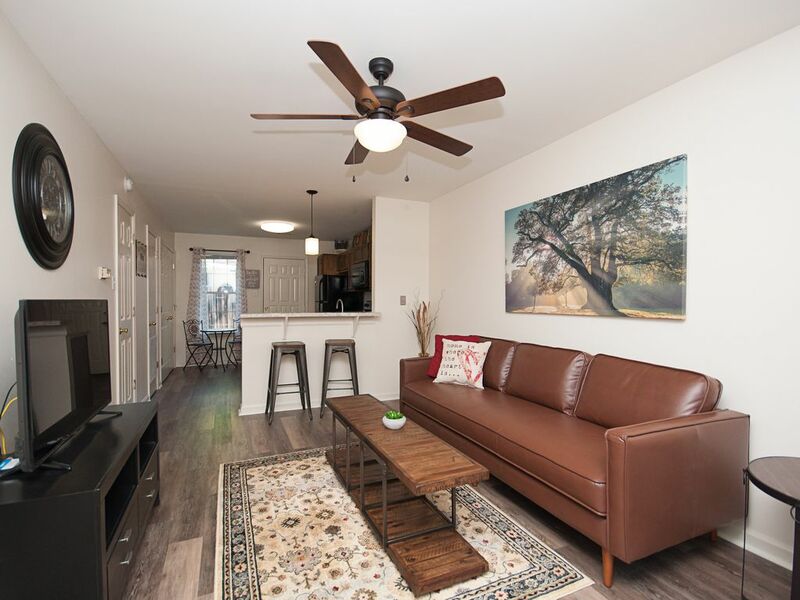 Everything you need is here with a fully equipped up to date kitchen, linens, basic toiletries, central heat and air, wireless internet w/wifi, flat screen TV, washer/dryer. Walk across the street to Hendrix College, you can also head to Little Rock which is only 30 miles away. We enjoy riding motorcycles, hiking, traveling and spending time with our family and friends. During our travels, we have had the best experiences staying at Vacation Rental Properties. Some of our favorite trips have been Germany, Nicaragua and Eleuthera - Island in Bahamas. This property in downtown has so much to offer – Very close to Hendrix College, UCA and CBC. You can enjoy all the excellent local restaurants, shopping, antique/flea markets – walking/biking trails, local parks and entertainment. Being centrally located in the state we have the best of both worlds, less than 30 miles to excellent hiking, biking, fishing, canoeing, boating and camping areas. Salt, Pepper, Spices, Oils, paper plates, coffee filters, coffee, foil etc. Dishes, pots and pans, toaster, coffee pot basic spices and oils. Kitchen is nicely remodeled with new appliances and fully furnished. We have 2 bar stools at the counter and a small bistro table with 2 chairs in the kitchen. The kitchen has a small bistro table with seating for 2 people and the bar/counter top has seating for 2. Approx 30 minutes from the Townhome at Woolly Hollow. Property was neat and clean and had everything we needed. We had a wonderful time! The townhouse was cozy and comfortable. The space was clean and cozy. Everything we needed for a relaxing 10 days. Clean and updated. Owner's were quick to respond to all questions. Really great and super close to Hendrix College. Looking forward to staying there again! Wonderful having your family and you as our guest! Look forward to your next visit. The townhouse is as described! All the amenities you need. Kris was readily available and a wealth of knowledge. Super close to Hendrix College and downtown. We loved having you as our guest and are excited for your future adventures. Four guys arrived in Conway to watch the UCA Bears host a playoff football game. The Bears lost the game but this townhouse was perfect! It was very clean, nicely decorated and will equipped. Kris was extremely nice and responsive. The location was convenient to the stadium, & downtown. This place is better than a hotel! Thank you Kevin! So glad you enjoyed your stay, you're welcome back anytime your in the Central Arkansas area. Address is 1536 Clifton. When you arrive, there will be a parking spot marked 8. That is for you. Some folks have had trouble with GPS taking them directly to the building. You are in unit 8 of an 8 unit complex. You are looking for a brick and vinyl building.